In 13 September 1956 IBM announced a new computer that was to change the way computers worked ever since. The IBM 305 RAMAC. 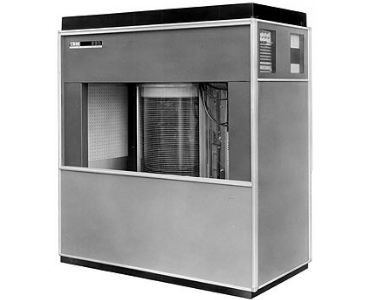 It was the first commercial computer that used a moving head hard disk drive, with magnetic platter. A technology which is still in use today. RAMAC stood for "Random Access Method of Accounting and Control". The first RAMAC to be used in the US auto industry was installed at Chrysler's MOPAR Division in 1957. It was configured with 50 magnetic disks containing 50,000 sectors, each of which held 100 alphanumeric characters. The original 305 RAMAC computer system could be housed in a room of about 9 m (30') by 15 m (50'); the 350 disk storage unit measured around 1.5 m² (16 sq ft). It weighed in at over a ton. The IBM RAMAC 305 system with 350 disk storage leased for $3,200 per month , equivalent to a purchase price of about $160,000. More than 1000 systems were built. Aren't you glad for your 4GB SD card, which weighs in at mere grams. In July 2009 Kingston announced their 256GB DataTraveler 300 USB flash drive. The transfer write speed maxes out at 10Mbps while read time is 20Mbps and weighs in at mere grams. Priced, around $900. Wow haven't we come far since 1956. But for kicks I though we could do a comparison and a ridiculous forward project. What would our 256GB flash drive be if we used 1956 technology. The RAMAC disk weighed in at 200kg per MB. Our Flash drive is 256GB making that a comparative weight of 51.2 tons. The Flash drive would occupy storage space of 76.8 square meters. The cost, here is the killer. The RAMAC leasing costs today with inflation would be $25,648.12 pm. Making that a cost of $5,130 per MB. Purchase price would be $1,282,405.88, $256,481 per MB. The Flash Drive then would cost in today's price using the RAMAC’s price, $65,659,136,000. Are you now still going to complain about the cost of your Flash Drive?